County courts and recording offices house many types of records, including deeds, mortgages and court proceedings. Although many of the real property or real estate records are available for viewing online, court records are often not so readily accessible. 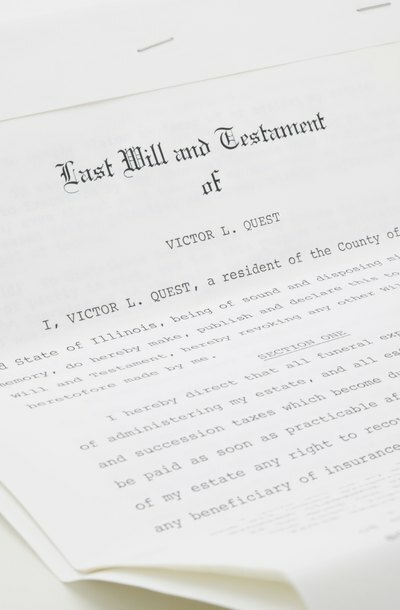 Key pieces of information regarding wills and estates may be available online in a few select counties in a few states, even though the actual wills themselves are rarely available for viewing. Locate the court or division that is responsible for probating estates in your state and county. The names and types of these courts differ from state to state. Many states have separate probate courts, while others delegate estate and probate matters to either their district, superior, family, circuit or chancery courts. Navigate to the website for that county’s estate court and look for “judicial” or “court records,” “online services” or other such similar designation. Determine at this stage whether or not online estate record searches are available for that county. If you find no online search resource, contact information will likely be available on the website to contact the clerk’s office to determine how to obtain copies via mail or in person. Choose the appropriate court as necessary from the home page and locate the search feature for estates and probate information. Make sure you are searching by deceased party instead of attorney when typing the name. Search functions will vary by website. View the resulting records. You will generally be able to obtain key information, such as a case number, the date of death, the day the will was presented to the court for probate and the name of the executor or personal representative of the estate. Rarely, counties will actually have viewable images of wills online, although you may be required to register or subscribe to the site to obtain those images. Each document filed in the estate should also be listed, providing a summary of the transactions that have occurred since the original filing. Write down or print the resulting information to take with you to the county courthouse to locate and view the actual will and resulting case documents if unavailable online. State statutes protect a will from the prying eyes of the public until a testator dies. During her lifetime, the testator can amend or revoke the will freely and confidentially as her circumstances change. Upon the testator's death, the latest version of her will moves to probate court for administration. The minute the will becomes a court document, it also becomes public information that's open to public viewing. What Is an Heir Affidavit? In many cases, a person dies without a will, or the will is declared invalid by a probate court. In such cases, distribution of the decedent's property proceeds under the state's intestate succession laws. If the decedent owned real estate, the estate must transfer title to the real estate to the rightful heirs. An heir affidavit is a document containing sworn statements designed to prove that the person named in the affidavit is a legitimate heir under state law. This permits title to real estate -- and in some states, personal property -- to be transferred to that heir. How Can I Get a Copy of a Will? TV shows often portray a lawyer reading the last will and testament to the assembled family. In real life, you usually have to track down a copy of the will yourself. It is easier to get a copy of a will once the maker is dead. You can only see the will of a living person if she agrees to show it you. Once the maker is deceased, however, the will is generally filed with the court for probate. Like most court documents, the vast majority of probated wills are available for public viewing and copying. Can an Executor Endorse the Deceased's Check?